It'd been around for years, but 1984 was the year breakdancing went mainstream. There were films, songs, stories on kids' shows like Simon Townsend's Wonder World! and Wombat... In fact, my mum had probably heard of it. The best known crew associated with the craze was signed to a record deal and, this week in 1984, entered the ARIA top 50 with their debut single. It would be followed by even more breakdancing-related hits. There was a new number 1 in Australia this week in 1984 as Pat Benatar charged to the top with "Love Is A Battlefield". There she would remain for five weeks. She had two top 40 singles to her name - one of which was a live cover of "Imagine" - but this single from Nightline didn't become soul singer Randy Crawford's third hit. This post-Yazoo, pre-Erasure single from Vince Clarke (and Eric Radcliffe) featured a post-Undertones, pre-solo fame Feargal Sharkey on vocals. It had also been a UK top 5 hit. The Hooked On Classics series of albums (and one top 10 single) had been an early '80s phenomenon, but there was little interest in this symphonic medley of local standards like "Click Go The Shears" and "Waltzing Matilda". After festive ballad "2000 Miles", The Pretenders kicked things up a gear with this rock track from Learning To Crawl. It'd be the band's last appearance on the ARIA chart for two-and-a-half years. Well, this was a surprise. Duran Duran's previous two singles, "Is There Something I Should Know?" and "Union Of The Snake", had debuted on the ARIA chart at number 6 and 8 respectively. "New Moon On Monday" had entered the top 100 at number 70 before spending the next eight weeks going 48-50-49-50-50-49-48-51. Of course, the big difference was that both those earlier releases had been unavailable on an album at that point and "New Moon On Monday" was included on Seven And The Ragged Tiger, which had been out since November. 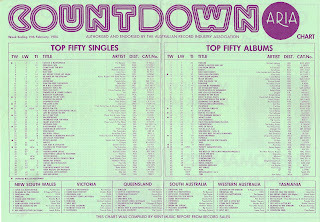 It wasn't the first time Duran Duran had experienced a flop single in Australia, with "Careless Memories" (number 60), "Rio" (number 60) and "Save A Prayer" (number 56) all having under-performed - so maybe it's not that big a surprise. I like "New Moon On Monday", but I've never watched the music video before, which is apparently the band's least favourite and features some pretty hilarious dancing at the end. You can just imagine the meeting at the record company: "How can we jump on this breakdancing thing all the kids are into?" For Charisma Records, it was to snap up America's preeminent b-boy crew, who already had some exposure thanks to their appearances in Flashdance and Malcolm McLaren's "Buffalo Gals" music video. The young dancers were signed to a record deal they didn't understand, and given a song co-written and co-produced by Stephen Hague (who'd go on to become one of my favourite producers) that didn't exactly challenge their limited vocal abilities. 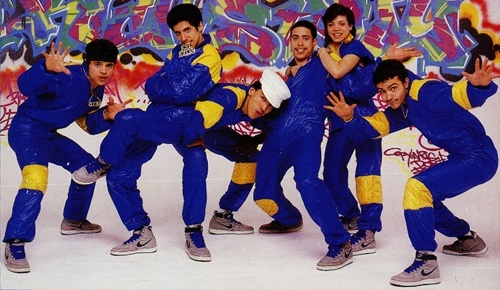 Sometimes such cynical cash-ins can fall flat, but "(Hey You) Rock Steady Crew" was a great pop song that was brought to life in the music video, which allowed the Crew to show off their real talents. In late 1983, Robert Plant had scored his first solo hit with a song that wasn't actually about a large piece of wood. In early 1984, he was back in the chart with a song that wasn't a remake of the Glenn Miller big band classic, although I'm kind of intrigued what that might have sounded like. Probably more interesting than this "In The Mood", which isn't much of a song at all and I'll no doubt have forgotten by the time I get to the end of this sentence. 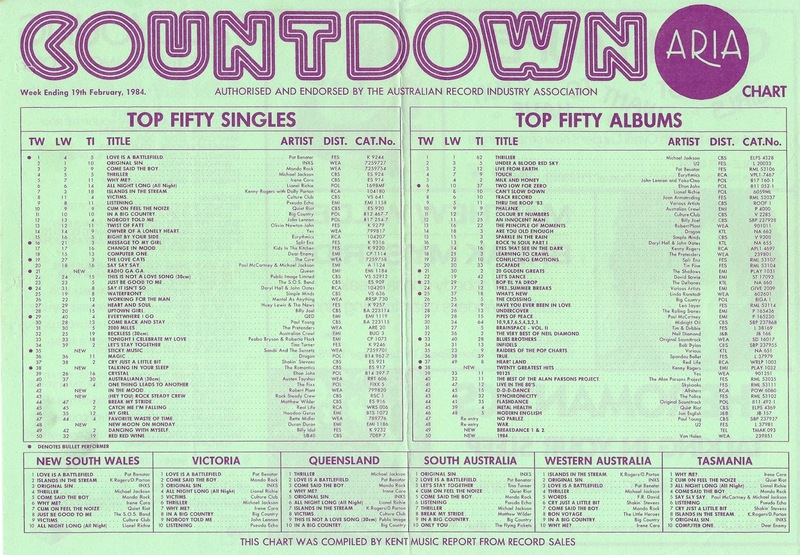 The next time we'd see Robert in the top 50 it would be with a cover version - The Honeydrippers' version of "Sea Of Love" would arrive in the final weeks of the year. Just when it looked like The Romantics' hit-making days - or should that be day? - were behind them, they pulled another big single out of the bag. Not quite as huge as "What I Like About You" in Australia, "Talking In Your Sleep" was far and away the band's biggest hit in the US, where it reached number 3 (compared with number 49 for "What I Like..."). The song also reached the UK top 20, but not for The Romantics. A quickie cover version by Bucks Fizz charted there. Someone might have to explain "Sticky Music" to me. I have no recollection of it from the time, which is odd given it almost made the top 10. And listening to it now, I don't quite understand how it was such a big hit. I expect Countdown played some part in that. It's a pleasant enough tune, but also sounds a little like a chewing gum jingle. Fronted by the half-American, half-Japanese singer Sandra O'Neale, Sandii And The Sunsetz never returned to the ARIA chart after this. The week's highest new entry came from a band that were making their return to the ARIA chart after two years away. Last seen on the top 50 with 1982's "Body Language", Queen sped up the rankings with this first single from The Works, proving they'd lost none of their popularity in their absence. "Radio Ga Ga" was written by Queen drummer Roger Taylor after he heard his son say "radio caca" and is a comment on music video taking over from increasingly predictable radio playlists as the dominant medium in music. It's also classic Queen, with its audience participation handclaps and anthemic quality. The song, from which Lady Gaga took her stage name, almost gave Queen their third chart-topper, but thanks to Pat Benatar, they had to settle for number 2 instead. Next week: two of the most-talked about hits of 1984 - one, a record that'd been banned in the UK and the other, a hit from the latest gender-bending star. Plus, a hard rock act discover synths. Sandii And The Sunsetz did indeed appear 'live' on Countdown. They also toured Australia at the time. The song was also included on the compilation LP Throbbin'84. I can only assume the above reasons, combined with the song's unusual but catchy sound led to its popularity. I really like the song, BTW. "Sticky Music" was huge when it was released. I watched Countdown religiously and Molly was a massive fan of both the group and the song, which, of course, led to a lot of airtime (so your suspicions were accurate, Gavin!). Sandii and the Sunsetz appeared live on the show and they pretty much got weekly airplay (leading to the #11 peak). As for the Robert Plant song, I remembered it instantly. It got a lot of airplay in SE QLD. Feargal & Vince was an odd coupling, though the song's not too bad. That 'New Moon on Monday' chart run gives Sinitta's 'Toy Boy' a run for its money with hovering in the bottom few positions of the top 50. To go one better, one of my grandmothers (and *not* the 'cool' one) had heard of breakdancing by 1985. I liked the previous Robert Plant entry, to my surprise (and even downloaded the song afterwards), but this one is boring. I have wondered if Sandii was the inspiration for the spelling of Dannii. I knew, and liked, 'Sticky Music' at the time, but totally forgot about it until catching it on a Countdown repeat. I think its appeal was largely that it was different, and I guess it was a novelty to have a Japanese act in the charts. To be quite honest unfortunately I don't know any of the songs here except Radio GaGa. What a ripper it is though. It's my favourite Queen song although my mates beg to differ. I also know a fair few Duran Duran songs too but unfortunately haven't come across this one. I'm really enjoying your weekly updates on the charts Gav. Keep up the awesome work! Loving these 1984 charts from the last few weeks. A lot of these tracks were featured, as Andrew mentioned above, on Throbbin' 84, an album very dear to my heart, as it was the first album I ever bought with my own money as a 9 year old!